You've got a lot of work to do, and the right desk will make it much easier to accomplish your goals. That's where a U-shaped desk can make a big difference. If you have the floor space in your corporate or home office, why not treat yourself to a command center that empowers you with the space you need. 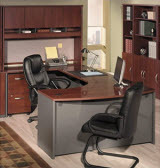 U-desks are often seen in executive suites, attorney offices, and in the offices of prolific writers and day traders. With a u-shaped desk you'll enjoy unparalleled horizontal work space, and can keep your office supplies and files at your fingertips at all times. Here is our list of the best U-shaped desks for sale online. We offer a short review of each included U desk. There's something for every budget and design aesthetic here. In this section we offer a side-by-side quick comparison of the best U shaped desks available for purchase online. Detailed reviews, buying advice, and information about our selection and review process can be found immediately following this quick-view list. These desks are listed in order of price, with the most expensive U-shaped desks at the top of the list, and the most affordable U desk / workstation options at the bottom of the list. We love the Series C line from Bush Business Furniture - one of the leaders in sleek, high-quality office furniture that lasts for years . The Bow Front on this U-shaped desk with hutch and large storage cabinets makes it truly unique, and an exceptionally functional statement piece for any home office. 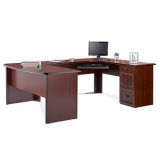 This bundle represents an exceptional value, even though it's the most expensive U-desk package on our list, as it includes a 72 inch wide bow-front client-facing desk, a left-handed corner desk, a 36 inch 2-drawer file cabinet, and a 72 inch wide 2-door hutch with an attractive fabric-covered tack board, 6 cubby shelves, 2 closed compartments, and a finished back panel. The Series C U-shaped desk from Bush Business Furniture can be ordered to match with any decor, as it comes in 6 unique finishes including Warm Oak (pictured), Light Oak, Hansen Cherry, Natural Cherry, Auburn Maple, and Mahogany. I love that the lateral file cabinet is included, and there is ample space for all of your files and paperwork. Thermally fused laminate will stand up to every day use, avoicing scratches and stains, and the desk comes with a 10-year warranty, providing peace of mind when you purchase this piece of furniture. Perfect for developers, attorneys, and executives, the Sauder Heritage Hill Collection U-Desk is a beautiful, sturdy statement piece which will improve the functionality and design of any office. At 442 pounds, this U desk is heavy, and it is constructed of solid, high-quality engineered wood with a stunning cherry laminate finish. One convertible pencil drawer is present, and the desk comes with two hanging file folder drawers, and a pair of box drawers for storing equipment and other items you don't use every day. Sauder offers a 9-year guarantee on all orders, offering peace of mind when purchasing this beautiful desk. If you're looking for a u-shaped desk with a hutch, you're in luck because the Heritage Hill Collection from Sauder is available with a matching hutch which is very attractive. Other office furniture like additional file cabinets, bookcases, and more are also available if you search "Sauder Heritage Hill" on Amazon. This is an impressive desk and a great value, especially with the 9-year manufacturer's guarantee. At right around $1,000 the Prestige U-Shaped Workstation and Desk from Bestar represents a fantastic value. The desk's work surface is 1" thick and finished with a durable melamine which resists scratches, stains, and signs of wear, and the desk's pedestals offer you a file drawer and several utility drawers. The bottom drawers lock for added security if you have sensitive information in your files. This desk is reversible, allowing owners flexibility when setting it up to suit their space (something we loved), and the Bordeaux and graphite finish on this Bestar U desk is impressive in person (most of the photos don't really do it justice. It's available in several other finishes as well should you want a different look for your corporate or home office space. We have quite a few Bestar U-Desks on this list because thir price point and quality is impressive, and while we didn't love the finish as much as the Sauder or Bush Series C models that were a little more expensive, the Bestar Prestige Plus U-Shaped Desk is a great option. I love the Bestar Pro-Linea U-Desk in white. It comes in Bark Grey and Oak Barrel finishes as well, but I think the white is just stunning for designers or developers working in a modern office. The work surface is a beefy 1.5" of commercial grade material that feels rock solid. It's covered in a thick melamine finish which holds up well to everyday use (and abuse), and the PVC edgue of the table and bridge feels solid and durable as well. This U-desk's credenza includes one final drawer with a letter/legal filing system, three shelves (one of which is adjustable), and a utility drawer for items you want to keep out if sight. The bright white paired with the matte-finish square metal legs offers a unique, modern feel to this "not your daddy's" U-shaped desk from Bestar, and we think you'll be really happy with your purchase. At under $1000 I can say with certainty that the Corsa series U-shaped desk from Bush Business Furniture is a steal. It might be my favorite desk on this list, and if you want a U-desk in a smaller office space, this is definitely the model you should buy. At 59.5 inches deep, it has a smaller footprint than most of the other desks on this list, but it doesn't feel small. Quite the contrary, when you sit at the Corsa you'll feel ensconsed (in a good way) and ready to take on any task that comes your way. The thermally fused laminates offered on the work surface of all Bush Business Furniture desks is incredibly tough. I think you'll be hard pressed to damage it, even if you try to do so. If you need more filing space, the corsa series mobile pedestals (both 2-drawer and 3-drawer) offered by BBF can be purchased to slide neatly under the desk in whatever position you require. If you spend long hours at your desk every day, you'll be glad you purchased this workhorse from Bush Business Furniture, especially when you remember that it comes with a 10-year warranty. Manufactured in Canada, Bestar’s Ridgeley line of U-shaped desks is well-made, solid, and backed by a 10-year warranty. I love the contemporary styling and geometric lines of this desk, which will work well in a large home office or corporate office setting. Each of the drawers in this desk ride on well-made ball-bearing drawer slides which glide smoothly and provide a solid “feel” to the drawers as you open and close them. The work surface is a durable commercial-grade melamine that is a full inch thick and gives the desk a substantial look and feel. The pedestal base comes with a modest panel, and three drawers, including a file drawer, box drawer, and a door. Bestar’s Ridgeley U-desk represents an excellent value, especially with the included storage hutch and the manufacturer’s 10-year warranty. You can’t go wrong with this one. We’ve included many of Bestar’s U-shaped desk models in this list for the simple reason that they are well-made, cost-effective, and backed by an impressive 10 year warranty. They’re also attractive, and this contemporary workstation in Bordeaux-finish veneer with a graphite metal base is no exception. The edging of the 1-inch thick melamine work surface is an impact-resistance PVC which in no way feels cheap (on the contrary, it will probably stand up to more abuse than an expensive solid wood desk top would). This U desk features classic lines and moldings and includes a modesty panel, and the pedestal offers you a filing drawer (set up for letter or legal filing) and two utility drawers. The bottom two drawers can be locked. This is a clean, utilitarian workhorse, and if you have experience assembling modern furniture you can expect this to be set up in under two hours. We like it a lot. While many of the U-shaped desks on this list can feel too corporate for a home office, the Series A U-shaped corner desk from Bush Business Furniture offers a softer color scheme and curved lines that create an inviting, more relaxed work space. This desk is available in several different finishes, including Hansen Cherry, Natural Cherry with Slate, Pewter, Slate, and Light Oak with Sage (pictured). What I like best about this desk (and what makes it stand out from others on this list) is the peninsula, which allows clients or coworkers to comfortably pull up chairs to take full advantage of the thermally fused laminate desk top. I’m in love with the desk tops from the Bush Business Furniture pieces. They have a beautiful glossy finish, are scratch and stain resistant, and have a premium “feel” while working at your desk. Combine that with excellent wire management (desktop and leg grommets which connect to wire channels in the modesty panels). The 2-drawer pedestal offers a box drawer for supplies and a full-extension file drawer. Like all U-shaped desks from Bush Business Furniture, this piece of office furniture comes with a 10-year warranty. You won’t regret purchasing the Series A desk. I really like the flexibility offered by the Ameriwood Home Pursuit line of office furniture, which includes a bundle to create a custom a U-Shaped desk with hutch setup. The pieces are modular, meaning they don’t lock together like many of the other desks on the list. This sounds like a negative, but with the weight and stability of each piece I didn’t find this to be a problem at all, nor did others who have reviewed this set-up. The modular nature of this U-shaped desk makes it ideal for home offices where space is at a premium, or where custom orientations of your furniture pieces may be necessary. The desk material is great quality for this price point, and the hutch offers 5 cubbies to keep paperwork and files neat and within reach, as well as two sliding doors and a fabric pin board across the back to keep notes, photos, and reminders on. I really love the gray and white coloring, though it does come in different color options to suit your office wall color and decor. I like this unit a lot and most customers report quality freight shipping and delivery and relatively short assembly times for a piece of furniture this size (2-3 hours). It will be worth the effort - this desk from Ameriwood Home is beautiful. If you are on a budget but need a U-shaped desk with lots of horizontal workspace, you should consider the Realspace Broadstreet Executive U-shaped Office Desk. The materials used are not the highest quality, and the price reflects that. That being said, at under $400 this desk is a steal, and most budget-conscious shoppers will appreciate the look, feel, and quality of this piece of furniture at a terrific price point. 3 drawers (one drawer comes with a solid lock to keep your files secure) come in a desk pedestal, and modesty panels are included. There is a pullout keyboard shelf if you want to use it to free up desk space as well. If you’re looking for more storage, there is a matching hutch which can be purchased separately (something I like, because not everyone wants a hutch, and this way you only buy what you actually need). This piece is similar quality to what you would find at Staples or OfficeMax, but at about half the price of many of the other budget-friendly desks on this list, it’s a nice small U-shaped desk for a smaller home office, or for someone who is just starting out. We liked it, but for a few hundred dollars more we think you can get a better quality product (with a 9- or 10-year warranty) from Sauder, Bestar, or Bush Business Furniture. If you have the budget, I recommend buying from one of those manufacturers because the warranty provides great peace of mind on a big purchase like this. Once you have confirmed your office has sufficient space for one of these large workstations, consider the following three items when purchasing your U-Shaped Desk. In our research, these factors contribute most to a buyer's satisfaction level with their purchase. Stay within your means, and buy a desk that doesn't put you in an uncomfortable spot financially. It might help to set a budget before you start looking, then stick to it. Part of creating a functional work-space is design. Choose a desk that's beautiful and that will invite excitement every time you sit down to work or play. The quality of the desk's materials and how long it will last will play a significant role in how satisfied you are with your desk purchase. One final consideration when buying a U-Desk is the manufacturer's reputation. We only select desks from top-tier office furniture manufacturers ... companies that have earned a reputation for building quality furniture that lasts, and who stand behind their products. If you know what you want to spend on a U-shaped workstation for your corporate or home office, we hope these picks will save you some time. In our research we found these models to be the best value in the price-brackets listed below. We scour the web to learn all we can about the best desks available for purchase online. This list of desks was chosen based on a number of different criteria (see accompanying tab), and while we'll discuss the merits (and drawbacks) of each desk on our top 10 list below, we think it's important to be transparent about what went into our selection process, and how we arrived at this list of desks. We go into our review process with the understanding that no desk is perfect for everyone. We make every effort to save you time by identify the potential pitfalls of every product we review, in addition to the relative strengths of every desk on our "10 Best" lists. Look for the pro / con lists for each desk reviewed below - we think this will be helpful in selecting the right desk for you. This page is a resource which we update and enhance regularly. If you aren't satisfied with what we've chosen here today, or if we've missed something important (or left a great desk off the list), please let us know! While we work hard curating information about desks from around the web to save you time, and provide information which is fair, accurate, honest, and up-to-date, feedback from our discerning readers is important to us. Availability - We review desks which are likely to be available for purchase now, and in-stock in the future. Online Retailer Reputation - All of our desks in this list are from Amazon. This is a brand that we trust to deliver furniture in a timely fashion, and a brand that we know will stand behind their customers if anything is damaged in shipping. We also like that most Prime subscribers will enjoy free shipping, which is a big deal on large items like desks. Customer Reviews - We aggregate and manually read customer reviews on Amazon, on the manufacturer's website, and on other online retailers. More specifically, we spend extra time reading reviews at the 1- and 2- star level. While many people focus on the best or top reviews (which are helpful), we find that looking at low-rating reviews can provide insight into recurring issues that our readers should be aware of. While things can go wrong with any online purchase, in general we stay away from recommending products we consider "risky," so that readers who take our recommendations are likely to be completely satisfied with their purchase. Style - While everyone's design aesthetic is different, we make an effort to ensure that each curated list of desks we produce offers beautiful desks in several different styles. This way one of our curated desks is more likely to be just what you're looking for. Quality - When possible, we try to choose products built with quality materials which are more likely to stand up to heavy use. A lot of furniture these days is manufactured with fiberboard or press-board and veneer. While this furniture will sometimes be represented on our lists due to the low price point, we take extra time reviewing those products to ensure that the manufacturing process and materials don't negatively impact desk performance and strength. Price - We typically choose desks that are under $1,000 in price for our curated lists. Many of the desks we recommend are available for less than $300. This is intentional, because it's what most of our readers feel comfortable spending on furniture purchased online. In categories like this one (U-shaped), desks tend to be more expensive because they are larger, heavier, and it costs more to ship and build them. The same is true for high-end executive desks. Brand Reputation - If two desks appear comparable in quality, style, price, and customer satisfaction, we will typically recommend the desk which is from a known furniture brand. We feel that brands that have been around longer are more likely to stand behind their products, and probably have a streamlined shipping and return process. Join the 10 Desks Family!